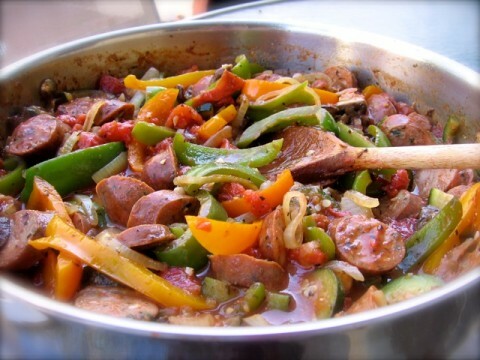 Sausage and peppers is an Italian-American classic. It’s a quick easy dinner recipe that’s also great when you need to feed a crowd. You could always count on a big pan or crock-pot (affiliate link) filled with sausage and peppers being part of the lineup at parties, buffets and holiday gatherings when I was growing up. I’ve collected my favorite easy recipes for sausage and peppers here all in one place – two that cook in the oven and one for the slow cooker. I’m sure one of them will be just what you’re looking for. Feel free to use whatever kind of Italian sausage you like best; pork, chicken and turkey all work well. This is a quick easy way to serve sausage and peppers when your feeding a crowd. If you’re lucky enough to have leftovers they make great sandwiches when served on crusty Italian bread. The recipe can easily be divided in half. Preheat the oven to 400 degrees F. Place the sausages in a large roasting pan. Add the peppers, onions, garlic. Season to taste with salt and pepper. Drizzle with olive oil. Roast in the oven for approximately 1 hour, turning occasionally, until the mixture is nicely browned. Another great variation of oven cooked sausage and peppers, this one with spaghetti sauce and mushrooms. This delicious sausage dish can be served on crusty Italian rolls, as part of a buffet or over spaghetti. Preheat the oven to 350 degrees. Cut up the peppers and sausage into bite sized pieces. Combine in a large (15×10-inch) baking pan. Cover loosely with aluminum foil. Bake at 350 degrees for 2 hours. Remove the foil and stir in the mushrooms and spaghetti sauce. Return to the oven and cook for 30 minutes more. 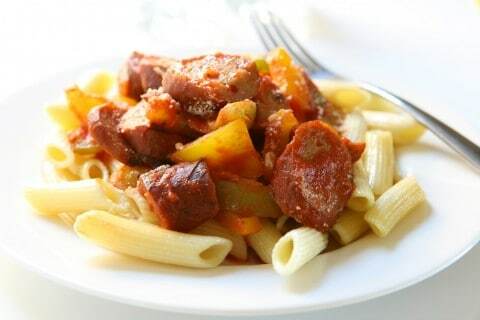 This easy sausage and peppers recipe is delicious served on crusty rolls or over pasta. How long this recipe takes will depend greatly on your slow cooker. I find that modern slow cookers, cook at a much hotter temperature (even when set on low) than they used to back in the 1970s, so recipes are often done sooner than expected. Place all ingredients in the slow cooker and mix well. Cover and cook on low until the onions and peppers are soft and sausage is cooked through, 3 to 6 hours.